Greater Manchester Police have named the suicide bomb suspect as Salman Abedi, 22. The attack on Monday night at Manchester Arena, which killed 22 people, including children, was carried out by a suicide bomber who died at the scene. Some 59 people were also injured in the blast. Chief Constable Ian Hopkins told journalists: “I can confirm that the man suspected of carrying out last night’s atrocity has been named as 22-year-old Salman Abedi. However, he has not yet been formally identified and I wouldn’t wish, therefore, to comment further. Hopkins added that a 23-year-old man was arrested on Tuesday in connection with the attack. Hopkins says police have also exercised two warrants, one in Whalley Range and one in Fallowfield, that included a controlled explosion to enable a safe entry. British police had asked the media to hold off on publishing the attacker’s name. Several American news organizations including CBS and NBC ignored the request, however, citing anonymous US officials who leaked the details from their conversations with British authorities. U.K. police: "Speculation is unhelpful and potentially damaging to investigation"
US security services: "Here you are"
The Prime Minister's spokesperson was asked during a press briefing on Tuesday afternoon whether they were concerned that information passed to the US had apparently been leaked without their consent by US officials. They were also asked whether they could trust that such sensitive information could be passed to the White House in future. The spokesperson replied simply that they “would not comment on leaks,” according to Business Insider. The Telegraph reports Abedi was born in Manchester in 1994, and was the second youngest of four children. His parents were reportedly Libyan refugees who came to the UK to escape the Gaddafi regime. The 23-year-old man arrested in connection with the attack is believed to be Abedi’s elder brother, Reuters also reported. While the working theory is that the perpetrator triggered the blast alone, the national counter-terror network are urgently piecing together his background to see whether he had any help in planning the attack. Reuters reports Abedi traveled to Manchester from London by train before carrying out the attack. Bomb squads swooped on a home in the Manchester suburb of Fallowfield to carry out a “controlled explosion” as part of an ongoing terrorism investigation, according to police. Police have also raided a property in nearby Whalley Range. “Police have executed warrants, one in Whalley Range, and one in Fallowfield, where a controlled explosion took place, as part of the investigation into last night’s horrific attack at the Manchester arena,” police said in a brief statement. A 23-year-old man has been arrested in connection with the Manchester bomb attack, police say. “With regards to the ongoing investigation into last night’s horrific attack at the Manchester arena, we can confirm we have arrested a 23-year-old man in South Manchester,” Greater Manchester Police said in a statement. 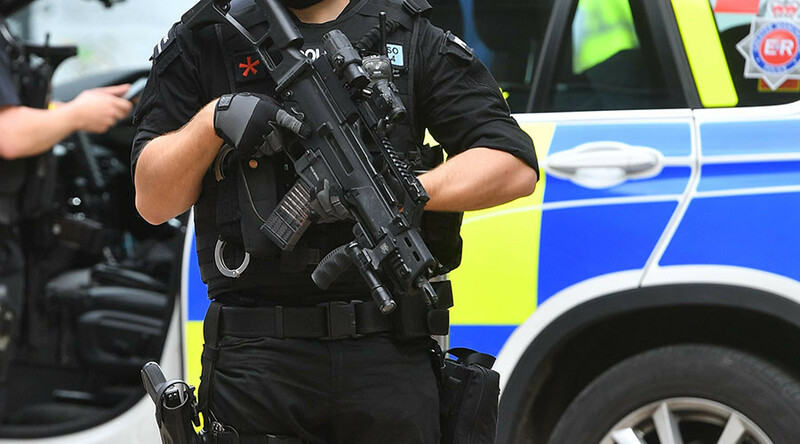 Another man was arrested in the Arndale Centre, but this is not currently believed to be connected to Monday night’s attacks. Speaking outside Downing Street on Tuesday, May said the attacker had chosen the time and the place to attack and cause "maximum carnage and to kill and injure indiscriminately." May said security services "believe the attack was carried out by one man" but need to find out whether "he was acting alone or part of a wider group." If others are responsible for the attack, they will be brought to justice, she said.